Join the cassowary rescue today! Rainforest Rescue has developed a plan - with the local community - to restore critical Mission Beach Cassowary corridors. The corridors will provide habitat, food, and a safe passage for generations of Cassowaries to come. Habitat loss and fragmentation have resulted in more than 80% of lowland tropical rainforest – the habitat of the Cassowary – is gone. The remaining habitat is highly fragmented, isolating populations, disrupting movement and bringing Cassowaries into contact with roads. Rainforest Rescue's support after Cyclone Yasi helped saved the lives of many Cassowaries. I want to thank you for that. Please also pass on my thanks to Rainforest Rescue's generous supporters. I am very pleased that Rainforest Rescue is going to continue the work to save the critically endangered Mission Beach Cassowary population. The Cassowary habitat restoration project Rainforest Rescue is funding and developing with the local community, is important to the long term survival and recovery of this ancient species. You have my full support for the project and I look forward to talking to you about its progress when I see you next. There have been 67 recorded Cassowary deaths from collisions with vehicles in the Mission Beach area in the last 15 years. Clearing, road construction and fragmentation of rainforest for residential development continues. With nowhere to go, cyclones pose an added serious threat to the cassowary. 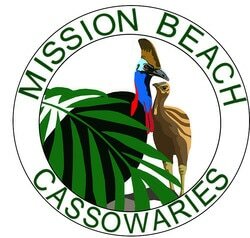 Mission Beach is in a vulnerable part of the coastline with three major cyclones in 25 years destroying the cassowaries food source. The main lesson learnt from past cyclones is the need to expand the fragmented corridors to make them more resilient to these extreme weather events which are predicted to be more frequent in the future. Federal minister Tony Burke has recognised the importance of saving ecosystems to help save endangered iconic species such as the cassowary. It is wonderful that Mission Beach still has a strong cassowary population but their fragmented habitat is in desperate need of repair.